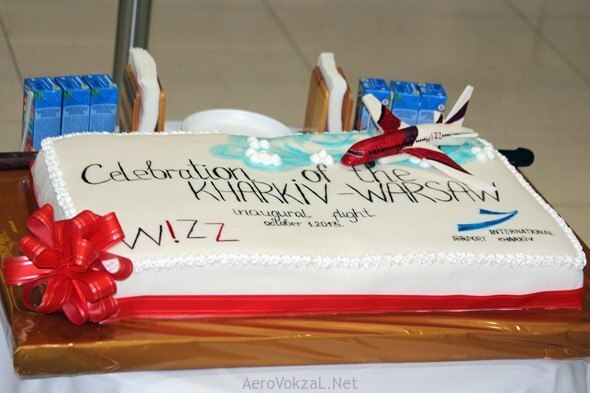 On 1 October 2013 there was held a presentation of the new regular flight between Kharkiv and Warsaw in International airport “Kharkiv”. Its main peculiarity is that the flights are operated by one of the biggest in Europe low-cost companies Wizz Air or more exactly by its subdivision Wizz Air Hungary. Kharkiv airport already has a positive cooperation experience with Wizz Air group: since 1 July 2013 the airlines has been operating flights between Kharkiv and Kutaisi (Georgia) twice a week (from October of the current year – three times a week). The direct air connection with the capital of Poland on the base of cooperation with Wizz Air gives to passengers of International airport “Kharkiv” a lot of objective advantages, the most attractive one is the flight cost. One-way ticket price is from 259 UAH, incl, taxes, among them airport ones, and fees for small cabin baggage. Firstly the flights are operated twice a week – on Tuesdays and Saturdays. The tickets can be bought at wizzair.com. It should be appreciated that Warsaw is a point of 22 low-cost destinations served by Wizz Air that allows passengers to save on further flights. Taking into consideration continuous growth of route network, the flight between Kharkiv and Warsaw has a great potential (today the airlines operates more than 290 routes in 35 countries). The new flight inauguration ceremony was opened by press-conference with the participation of Consul General of Poland Yan Granat, Corporate Communications Manager of Wizz Air Tamara Mshvenieradze, CFO of New Systems AM LLC (International airport “Kharkiv”) Alexey Ratay, Deputy Head of Kharkiv public regional administration Andrey Mochenkov. The Deputy Head of Kharkiv public regional administration Andrey Mochenkov pointed out at the importance of the direct air connection between Kharkiv and Poland: “We open not only a successful and convenient flight to Warsaw, but also create a bridge between Kharkiv and all cities of EU”. “Cooperation with Wizz Air is very promising for us, – underlined CFO of New Systems AM LLC Alexey Ratay. – At first it is based on the airlines’ operation specificity. The list of services offered by Wizz Air and more than democratic ticket prices allow more quantity of passengers to give their preference to air transport over other kinds of carriages and use its services more often either for business, or tourist goals. Consequently, it leads to passenger traffic increase. We already have plans of launching of the whole range of actual destinations in Europe in cooperation with Wizz Air. I hope, that they will be realized in the nearest future”. The Corporate Communications Manager of Wizz Air Tamara Mshvenieradze, in her turn, told that Wizz Air positively estimates the dynamic of cooperation with Ukrainian airports. “Today we gladly celebrate our first flight from Kharkiv to Warsaw operated with one of our Airbus A320, – she noticed. – The flight between Kharkiv and Warsaw operated by Wizz Air Hungary gives to passengers a low-cost connection with EU. We hope that the flight launching will help to stimulate tourist industry and business relationships between two countries. And we will be glad to see more passengers on board of our airplanes”. Making his speech at the press-conference, Consul General of Poland in Kharkiv Yan Granat expressed confidence that opening of the direct flight between Kharkiv and Warsaw would play a great role in further business and good-neighbourly relationships between two countries. “From now the capital of Slobozhanshchina and the capital of Poland are connected with the direct flight. It is a result of cooperation between Wizz Air, our consulate and International airport “Kharkiv”, – Mr. Granat commented the event. – I can assume that next year the tendency of visa issue by VAC (Visa Application Center) of Poland in Ukraine will grow up to 20%. Today, in general, business and sport relationships are developing. And we are going to do all possible to allow young people and students from Kharkiv and neighbor cities to see our wonderful country, to get to know its history and to taste original Polish cuisine”. At the end of the event the participants and mass media representatives went to the apron to the airplane parking (flights between Kharkiv and Warsaw are operated with Airbus A320, its capacity is 180 seats).